Tropical cyclone Bianca is fast approaching the Pilbara. Residents on West Australia’s Pilbara coast have been urged to get ready to take shelter as tropical cyclone Bianca closes in. The Bureau of Meteorology has upgraded the cyclone threat to a red alert for large parts of the Pilbara. The storm is currently lingering about 110 kilometres north north-west of Port Headland and 205 kilometers north-east of Karratha. It is moving west south-west at 27 kilometres per hour. A relocation point has been set up at the Karratha TAFE on Dampier Road and poeple are asked to bring bedding, food and water to last 24 hours. A number of roads have been closed including the North West Coastal Highway between the Great Northern Highway intersection and west of the Pannawonica turnoff. Dampier Road in Karratha and Roebourne Road in Point Sampson are also closed. The bureau warns Bianca is expected to intensify overnight and on Thursday as it moves parallel to the Pilbara coast. ”Destructive winds with gusts up to 160 kilometres per hour are possible between Port Hedland and Karratha later today and moving further west overnight,” the bureau said. People in Port Hedland and Karratha are being warned about the potential for a dangerous storm tide. ”Tides may rise significantly above the normal high tide mark with damaging waves and dangerous flooding,” it said. Damaging winds with gusts to 120 kilometres per hour are expected between De Grey and Whim Creek this afternoon, extending to Karratha late this afternoon or this evening and in Onslow and Exmouth on Thursday. Destructive winds with gusts to 160 kilometres per hour are possible between Whim Creek and Mardie later today, moving further west overnight. People west of Whim Creek are warned of the potential for a dangerous storm tide. Tides may rise significantly above the normal high tide mark with damaging waves and dangerous coastal flooding. 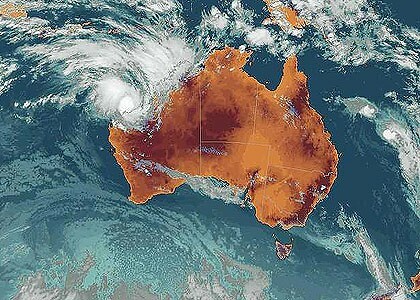 Residents in the coastal communities extending from Wallal in north to Whim Creek in the south, including Port Hedland and South Hedland, have been told to get ready to shelter from the cyclone. ”Fasten all cyclone screens and secure boats, caravans, trailers, garden sheds, outdoor furniture, rainwater tanks and LPG bottles,” the bureau said. People living in towns south of Whim Creek to Mardie, including the towns of Dampier and Karratha, have been told to prepare for dangerous weather. « AUSTRALIAN NATIONAL FLAG.WITH OR WITHOUT THE UNION JACK??? This entry was posted on Wednesday, January 26th, 2011 at 6:49 pm and is filed under WEATHER. You can follow any responses to this entry through the RSS 2.0 feed. You can leave a response, or trackback from your own site. Created by miloIIIIVII | Log in | 81 queries. 6.999 seconds. | Entries RSS | Comments RSS.